What does that mean anyway - "Teaching to the Test?" It's most often used in a pejorative manner, summing up most of what many folks see as wrong about our current public education system. The criticism, as I understand it, is that because of the significant consequences of low scores on standardized tests, educators are motivated to change their methodology so that the primary objective is for kids to score well on the tests, and that raising the actual knowledge level of the kids has become of secondary concern. A wise person once told me: "The problem with incentive systems is that they work." The point is that any system created to influence behavior will function as designed if the incentives - positive or negative - are great enough. The challenge is in creating a 'scoring' system for an incentive system which accurately relates consequences to the desired behavior, while advancing the objectives of the larger organization. For example, you have three kids in your household, one who keeps his/her room pretty neat and tidy, but the other two are slobs - clothes and trash everywhere. Finally, you get tired of the smell, and tell the two: "If you keep your rooms neat for one month, I'll buy you each an iPhone." That's a pretty meaningful gift for most kids, and there's a good chance that the two slobs will do exactly what you ask, at least for one month. But what about the neat kid? One reaction - the one the parents are assuming - might be for the neat kid to think: "I'm glad our parents are finally getting my sibs to clean up their rooms, it was getting pretty disgusting." Or it might be to think: "Gee, I'd like an iPhone too, and it seems like the easiest path is to make my room a mess as well." Testing has always been a part of education. The little kids take simple tests to evaluate their readiness to enter kindergarten. Teachers make up tests to evaluate which kids are learning, and which are not, as well as to figure out whether the teacher's approach to a topic is working. That is, if a test indicates that most kids are grasping a concept, then maybe just the few kids who aren't need some special attention. On the other hand, if few of the kids are showing understanding of a concept, perhaps the teacher needs to use a new strategy. Testing is a valid method for the teacher, students, and parents to give and receive feedback as to how the students are doing. I think this is the difference of then versus now: I don't believe that decades ago the results of those standardized tests were used to evaluate the performance of a teacher, a building (ie the administration), or the school district. At least not in any public way, or in a way that motivated teachers and administrators to materially change their approach to teaching. Today, it seems that teachers are tasked with not only conveying subject matter knowledge to their kids, but also coaching the kids in the use of strategies that help them perform better on the test. There are high stakes associated with test scores on all the standardized tests, which are administered here in Ohio from third grade on. It's not just the students who get evaluated. The buildings individually and the school districts as a whole also get a standardized report card, prepared by the Ohio Department of Education. To call these state report cards 'standardized' is a bit of hyperbole in my opinion. They've been tweaked a number of times since first being created a few years back. The motivation for change hasn't always been to gain a clearer picture of how the school district is performing as much as it has been to modify the political message. As I have been writing for years, suburban school districts like ours are being required to fund an ever-increasing fraction of our school budget with local money - all property taxes in the case of our district. That means putting an operating levy before the voters every 3 years or so. Depending on how good of a job we do controlling expenses, these levies will be larger or smaller, but chances are that there will still be one of some size on the ballot every few years - at least if the scope of programming and services in our district remains about the same. It's tough to get a levy passed if the State Report Card says a school district is not doing well. You can bet that there is plenty of lobbying on the part of the Ohio School Boards Association, the Alliance for High Quality Education (representing suburban districts, including us), the Ohio Education Association (the teachers' union), and all the other special interest groups formed in connection with public education - all with the mission of getting a State Report Card structure crafted that helped get levies passed, or a least doesn't get in the way. That's the reason more than 90% of Ohio's 600 school districts are currently rated as "Excellent" or "Excellent with Distinction." The Ohio Department of Education is now bringing forward yet another State Report Card structure, this time using letter grades from "A" to "F" to rate districts, on the theory everyone who has ever received an individual report card will understand this scale better than the "Excellent" etc system in use now. The trouble is that no school district in Franklin County would receive an "A" if the proposed, tougher scoring system were to be applied, and that has caused great concern. We would get a "B." After being rated "Excellent with Distinction" for four years running, we suddenly would be knocked down to second-class status. Not to fear. Already changes are being negotiated, as reported in a recent story in the Columbus Dispatch. What that means is that pressure is being applied to key politicians, including the State Superintendent, and deals are being crafted. We'll see how much this new system, if it actually gets implemented, is 'softened up' to prevent alarming the voters. Even if some alarm is warranted. If we're having this much trouble sorting through the politics of using standardized test scores to evaluate whole school districts, imagine the level of struggle associated with trying to use standardized test scores to evaluate individual teachers. We'll leave it to another time to discuss the merits and problems of measuring teacher effectiveness with standardized tests. The point here is that if standardized tests are used, and the test results have significant influence in terms of teacher compensation and working conditions, then the teachers will be powerfully motivated to instruct their students in a manner that maximizes standardized test scores, regardless of whether that results in a 'thorough and efficient' education for our kids. I'm not sure that's a good thing. The problem with incentive systems is that they work. Last month, I wrote a story about the natural gas purchasing consortium in which our school district participated as a measure to protect us from what looked then to be skyrocketing natural gas prices. Unfortunately, we ended up buying at near the high, with natural gas prices now about a third of what they were in 2008. A couple of Board meetings ago, we made the decision to buy our way out of that deal, and to enter into a new buying consortium. The question of course is which way we think prices are headed from here. New Albany (Plain) Local Schools faced a similar situation with their capital borrowing arrangements, according to a recent story in the Columbus Dispatch. New Albany Schools, like most school districts including ours, issues voter-approved bonds to finance the cost of constructing and equipping their school buildings. Those bonds are sold at whatever interest rate the market demands at the time of the sale, and the amount collected via property taxes is whatever is required to pay off the interest and principal on these bonds. When the voters pass a bond levy, this is what they agree to - to repay the money borrowed, with interest, within in a certain period of time. As we know, the Federal Government - ie the US Treasury in concert with the Federal Reserve Bank - have for several years now been aggressive in driving down borrowing rates in the hope of stimulating American businesses to crank up their activity, and to put folks back to work. This economic policy has also driven home mortgage rates to historical lows, prompting lots of homeowners to refinance, which lowers payments and/or shortens the time to pay off their mortgages. As a borrower, a school district would like to do the same thing. We've engaged in a bit of this here in Hilliard, recently issuing new bonds a lower rate, which allowed us to retire other bonds we were obligated to pay off at a higher rate. The folks in New Albany decided that 2007 was the right time to lock in a lower interest rate, just as we thought 2008 was the right time to lock in rising natural gas prices. However, none of their bonds where coming up on a 'call date.' When a bond is issued, it's like a mortgage in that it specifies both an interest rate and a term, usually 20-30 years. The buyer of the bond expects to be paid interest for the entire term, and then at the end of the term, get back the original price ('face value') of the bond as well. However, the issuer can choose to make a bond 'callable' on an earlier date, or several earlier dates. This gives them the option to pay off the bond early, just like a homeowner can pay off a mortgage early, except callable bonds can be called only on specified dates. New Albany had issued callable bonds, but in 2007, the next call date was another five years in the future, and they thought it was likely that the very low interest rate environment wouldn't last that long. So they did a deal called a 'synthetic interest rate swap' to give them the benefits of calling in their bonds, albeit at a premium. It turns out that interest rates did stay low, and had New Albany just done nothing for the five years, they would have been able to issue new bonds at a low rate, and used the proceeds to call in the older bonds issued at a higher rate - the customary route of refinancing. But they did do the synthetic rate swap, and have now decided to buy out of that arrangement. So was all this a bad deal for the people of New Albany? That depends on your perspective. The New Albany officials are correctly pointing out that the actions they took will result in less total cost to the taxpayers than if the original bonds had just been paid out through the original maturity date in 2029. That's true, but this statement leaves out the fact that they had a call date coming up in 2012, and would have almost certainly exercised that right. They go on to admit that, saying that their 2007 deal will in the end have cost them more than just waiting until 2012 and refinancing in a more standard manner. However, that's true only because interest rates have remained low when many people - me included - thought that the Federal Govt would have to resort to inflating the money supply in circulation to fund the stimulus, which would rapidly drive up interest rates - perhaps to what it looked like during the late 70s when the prime rate neared 20%. That is still likely, in my opinion, but it hasn't happened yet. We all need to stay on our toes! So New Albany ended up somewhere between the best case and the worst case. That's not a bad outcome. Running a school district is like coaching OSU football. For the folks running the district - the School Board and Administration - the clock is running, and decisions have to be made in real time. Everyone else gets to watch the films and analyze the statistics after the fact, then pass judgment from the perspective of hindsight. I like to collect leadership slogans, and one of my favorites is "A Good Decision Made Late Is the Same Thing as a Bad Decision." Our community spends a lot of money to operate our school district, and there are a number of multi-million dollar decisions that have to be made every year. It's very challenging to make those decisions when there is so much volatility in our economy. The investment professionals who manage the treasury of the State Teachers Retirement System guessed wrong, and in 2007 lost nearly half the value of their fund - more than $30 Billion. The leaders of our district had to make a decision about natural gas in 2008, when prices were skyrocketing. As Geddy Lee sang, "if you choose not to decide, you still have made a choice." They made the choice to lock in at what turned out to be a high. It seemed like a good decision at the time, and I might have supported it had I been on the School Board then. All we can do now is lick our wounds, get out of that deal, and move forward. Likewise, the New Albany leadership thought 2007 was a short-lived low period for interest rates, and took action. It cost them some money, and there's nothing anyone can do about it now. They're taking what seems to be the appropriate action going forward. These aren't the last times such decisions will come before a school board. Had the Hilliard School Board not locked in natural gas prices in 2008, and those prices had followed oil (which has more than doubled since 2008), we'd be spending a painful amount more to operate our school right now, and lots of people in our community would be casting blame on the school board for not locking in low prices when they could have. I've been a decision-maker for a long time, and I know that part of the role is getting feedback from those who weren't there when a decision had to be made. So I'm not complaining. I've given my share of post-game feedback as well. And I've volunteered to put myself in the position of being judged. So no complaints. But every once in a while, it's worth asking for a little empathy. I know almost nothing about pedagogy - the science of education. I didn't even know the word existed until our older daughter started college in pursuit of her music education degree, and would talk about her "music pedagogy" classes. That's one reason you don't hear me weigh in much on the way education is delivered in our schools. But I wanted to call your attention to a story that ran in The Columbus Dispatch recently about the "flipped classroom" concept being used by a math teacher at Darby High School, Wayne Tsai. Mr. Tsai gave the School Board a presentation about this concept at one of our meetings last fall, and I've been fascinated by it since. Having taken many a math class in my day, I know that the normal approach is to use the class period primarily to give a lecture - a one-way presentation of information from teacher to students - and for students to take notes, but not ask a lot of questions. At the end of class, homework problems are assigned, and the student goes off on their own to figure out the solutions. The "flipped classroom" approach is the reverse of that. Instead of going home and struggling alone to complete the assigned problems, the students are expected to go home and watch the lecture online. Then the classroom time is spend solving problems, when the teacher is present and able to give guidance and coaching. This makes perfect sense to me. If a student doesn't quite catch something in the lecture the first time, all s/he has to do is rewind the online recording a little bit, and listen again. And again if necessary. And then to have the whole class time to complete 'homework,' with the teacher and even some classmates to help - wow, that would have been very helpful. I was never a math savant like some of my friends, but accepted that I had to develop competence with the tool to be able to study other subjects more interesting to me, like physics and finance. I think that for me, this "flipped classroom" would have been a much more efficient and effective approach than the traditional method. One concern about this approach is that it assumes that every student taking the class has access to the Internet, preferably from home. I expect that this assumption is true for most of our students, but we need to make sure this isn't a separator between the haves and the haves-not. I heard Alvin Toffler, the well-known futurist and author of Future Shock, lecture in the 1980s that as time went on, access to information and technology would be exactly such a separator. I remember in my college math and physics classes - 40 years ago - the expectation was that you: a) owned a slide rule; and, b) could use it accurately and quickly. I'm sure that makes me sound like a dinosaur to some of you, but a slide rule was state-of-the-art in portable computing in those days. I still have mine, and remember how to use it. And it still works - it doesn't even need batteries. But the point is that it was assumed by the education system that I owned this piece of technology. In a brief period of time, the expectation for math/science classes became that you owned one of the fancy HP or TI calculators with trig functions. Then that evolved to the presumption of having a desktop personal computer with a tool like Lotus 1-2-3 and WordPerfect. Today, we're at the leading edge of figuring out how to use tablet computers, notably the Apple iPad, as the tool of choice for students. It won't be long before the paper textbook is a thing of the past, like my slide rule. We need to pay heed to Toffler's warning, and make sure that in the process of incorporating more technology in our teaching method, we don't leave behind any kids because their families can't afford what many in our community can. The mission of a public school system is exactly to eliminate such economic segregation (I'd argue that as a country we're not doing very well on this front, but that's for another time). Rewind the clock a few hundred years, and it was the book that was the expensive technology. Rich kids had access to books, both in their private school libraries, and in their homes. Poor kids might not hold a book in their entire lives, so why bother learning to read? Then along with public schools came public libraries. Anyone could check out a book with the promise to return it in a reasonable time so that someone else could read it. The technology became available to all, and there became a reason to learn to read. We should have an analogous solution in regard to access to online resources. For now, that might mean providing after-hours access to computer labs in our schools, such as the one being considered for the new Innovative Learning Center. The computers are already there, we just need to provide the supervision and security. In time, it may mean making iPads or similar devices available for checkout. We're not ready for this yet. Among other issues is the one of theft. Public libraries already have a problem with valuable books being checked out and sold on eBay. When a book is 'lost,' all the library requires is that the borrower pay the original purchase price of the book. That's not working. Nearly all the copies of one of my favorite books is now gone from the Columbus Metro Library System because thieves figured out that it could be sold on eBay for many times its original acquisition cost. It's now out of print and irreplaceable. I'm fairly confident that if we loaned out a bunch of iPads, some of them would appear on eBay and CraigsList within 24 hours. We don't have that problem with expensive chemistry or history textbooks because there is no resale market for them. In spite of these issues, I applaud Mr. Tsai and his colleagues for giving the 'flipped classroom' a try, and the administrators for giving the go-ahead. I believe we'll see success with this approach, and hope it can be applied to other subjects in more of our buildings. Reynoldsburg City Schools may adopt an 'open enrollment' policy, according to a recent story in The Columbus Dispatch. Open enrollment means they will enroll any kid who wants to attend Reynoldsburg public schools, tuition-free. In return, Reynoldsburg schools will receive the $5,700/student in funding Ohio's public school systems receive each year from the State of Ohio. And it means the student's home district will lose the $5,700. I'm a big believer in Adam Smith's Invisible Hand. When there are buyers who are free to chose what to buy, from whom to buy it, and what price to pay, they will drive producers to develop innovative products which meet the buyer's value requirements. Wounded as our economy might be right now, there remains a fundamental resilience created by the opportunity any person has to invent a new product or service, or improve one already out there, and take it to market. To be sure, some sectors of our economy are suffering. Meanwhile we have seen the rise of companies such as Facebook, and the resurrection of Apple. Even the American auto industry is looking better. Chrysler has paid back all the government loans it received, and is making a profit. GM is taking back market share from the foreign automakers. And Ford confidently strode through the whole crisis without needing a government bailout or declaring bankruptcy. How? They finally started making products that Americans - and people around the world - want to buy. Their new lines of cars are exciting, high quality, and priced competitively. I think we could use some of that in K-12 education. What if the public school a kid attends is no longer dictated by the address on the front of their residence? What if the kid's parents can easily choose which school should get their education dollars? How would parents make that choice? What might things look like if such freedom of choice were made available? How would the economics work out? Some parents already have that choice. After all, the only thing you have to do to change which school your kid attends is to move to an address in the attendance area of the desired school building, right? But that means selling the house you live in now, and buying a new house in the desired neighborhood. Some folks are wealthy enough to be able to absorb the likely loss associated with selling a house in the less desirable school attendance area, and have sufficient resources to buy a new house in the more desirable school attendance area. More folks are pretty much stuck where they are. Not only can they not afford to sell and move, they're being asked to pay ever increasing property taxes to fund the school district in which they're trapped. By the way, this Reynoldsburg situation doesn't change the tax picture. If you own a home in the Gahanna school district, and decide to enroll your kid in Reynoldsburg schools, you will still have to pay Gahanna school taxes. You just won't have to pay any tuition to send your kid to Reynoldsburg. You'll have to decide whether - at the same price - Reynoldsburg schools are a better value than Gahanna schools. I'm not sure how many would make that choice. Gahanna schools are rated Excellent with Distinction, meeting 26/26 indicators, with a Performance Index of 101.2. Reynoldsburg schools are pretty good too, rated Excellent, also 26/26 on the indicators, with a Performance Index of 100.3. It's true that Reynoldsburg spends $2,000 less per student per year than Gahanna - $9,679 vs $11,832 - but that doesn't enter into the value decision as a Gahanna resident would continue to pay Gahanna school taxes even if their kid enrolls in Reynoldsburg schools. Of course the much more likely choice is for kids attending Columbus City Schools to seek a seat in the Reynoldsburg schools, although there might be some interest from kids in neighboring Licking County as well. Let's examine some of the economics. From the perspective of the parents, it's pretty simple. No change in taxes, but probably some additional transportation costs. It's unlikely that any kids a long distance from Reynoldsburg will want to transfer and have a long daily commute with gas approaching $4.00/gallon. However, Reynoldsburg High School is right on Livingston Ave, with a COTA stop within a mile. I'm sure that with enough regular riders, COTA would extend their route to the high school. An unlimited-ride bus pass good for one month costs $31 - about $1.50/day. That makes Reynoldsburg schools pretty accessible to lots of kids. But how can the Reynoldsburg school district afford to take in kids who bring with them only $5,700/yr in state funding, when Reynoldsburg is spending $9,679/yr for each of their kids right now? As the Dispatch story correctly points out, all Reynoldsburg has to spend is the incremental cost of an additional kid. And if there's an empty seat available, that incremental cost is pretty much zero. And unlike the case for new kids who actually move into their community, Reynoldsburg can shut off new enrollment to outside kids when they reach capacity. I first wrote about this phenomenon back in 2006, in an article called "Fixed Costs, Variable Costs." The point is that the cost to run a school district doesn't change much when you add or subtract one kid. So if Reynoldsburg can take in some number of kids, and gain $5,700/yr in revenue each, that's pure positive cash flow for them. And it's pure loss for the school district they come from. This is why public school districts get so wound up about charter schools, because kids attending those community schools take their $5,700/yr of state funding with them, while the cost to operate the public school district changes very little. From the perspective of the school districts who might lose kids to Reynoldsburg, the Reynoldsburg school district feels just like a charter school. You can bet that the leadership of the neighboring districts are pretty miffed at Reynoldsburg for even considering open enrollment. How should the taxpayers of Reynoldsburg feel, knowing that this would open the doors to kids whose families aren't paying Reynoldsburg taxes? Well, from an economic standpoint, the Reynoldsburg community should feel pretty good about this. It's smart business - more revenue, no cost. Every dollar in revenue they bring in this way is a dollar of revenue they don't have to generate with more property taxes. Seems like a good thing. But there's another, more troubling angle on this. Already the Dispatch story has attracted this comment: "Well, there goes the neighborhood." I'm sure "Big T" is not alone in this sentiment. We all know that it is illegal to discriminate because of race, religion, gender, and age. But discrimination based on wealth is okay. One could observe that it's not just okay, it's the driver behind a capitalistic economy. The whole idea of a free market economy is to motivate and reward individuals for working hard and taking a risk here and there. Clearly, one of those rewards has always been the freedom to form an association structured so only those of one's own economic status can be a member. That's the reason people join exclusive country clubs when they can't golf worth a lick, or why they move to expensive suburbs. Why do we have all these suburban school districts instead of a single countywide school district? Because, as Elizabeth Warren has observed, the price of admission into a great public school district is typically a house in an expensive neighborhood. It automatically filters out the underclasses, and is completely legal. This can occur even within school districts, and it has in ours. Just read some of the comments a few of our community members made when, subsequent to the opening of Washington Elementary and Bradley High School, the school board was making the decision about which neighborhoods would be assigned to which building. There are powerful forces who want to keep things as things as they are: suburban schools, closed enrollment, and no charter schools (because they get the $5,700 in state funding). But what is this frame of mind costing us in terms of innovation, quality, and tax burden? I can tell you that the small amount of competition we see now from charter schools is motivating public school leaders to think about how to 'win back' those kids. To be sure, they're lobbying hard at the Statehouse to put the charter schools out of business. But I think they accept charter schools, and perhaps more cases of competition between public school districts like the Reynoldsburg example, as something they'll see more, not less of. I think it will be good for everyone in the long run. The Sunday, March 25, 2012 edition of The Columbus Dispatch included a story about the seemingly never ending debate about how to fund Ohio's Schools. Two primary factors drive the funding needs in school districts - growth in student population and growth in the cost of compensation and benefits. Most school districts in Ohio, including ours, have not had much growth in student population for the past several years, so it has mainly been the compensation and benefits costs which have driven our spending growth rate. To put it bluntly, this dialog about school funding is really about how much more money the people and businesses of Ohio should pay in taxes so that more money can be spent on the teachers, staff and administrators employed by our school districts. That's not an ultra conservative, extreme-right, gonzo Limbaugh-loving radical viewpoint. It's just the raw truth. Most of the professionals employed in our school districts are classroom teachers - and that's as it should be. The amount that is spent on compensation and benefits for those teachers is driven by two primary factors: a) the ratio of kids per teacher; and, b) the average compensation per teacher. There is no 'right' number for either of these two factors. It is generally believed that the lower the student/teacher ratio, the better it is for the kids. It seems intuitive that - all other things being equal - the fewer kids a teacher has to work with, the better. But is there one "right number" that everyone agrees we should shoot for? We know it can't be 1/1. And we know it can't be 100/1. The so-called Evidence Based Model put into place by the Strickland administration set the Regular Education Teacher ratio to 19/1 for grades K-3 (line 6A) and 25/1 for grades 4-12 (lines 6B-6D). 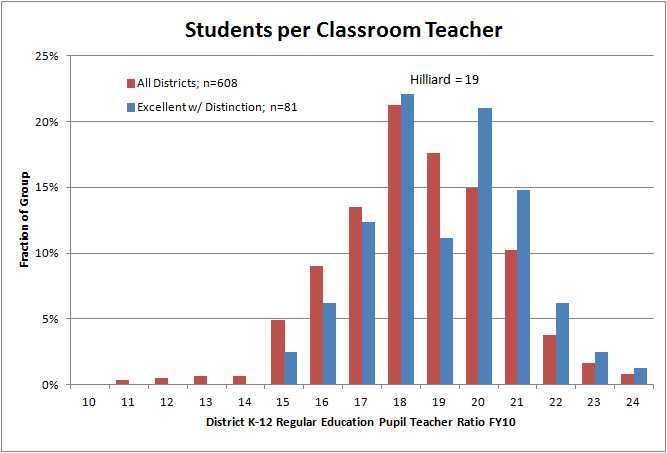 It calls for Hilliard Schools to have 674 teachers. According to the State Board of Education's Cupp Report, the overall student/teacher in Ohio's public schools is 17.2/1, and it ranges from 10.8/1 in Fayette Local Schools (Fulton County), to 25.3/1 in Lorain City Schools (Lorain County). The chart below shows what percentage of districts have various average Pupil/Teacher ratios. Most districts have 18 to 20 kids per regular education teacher. Notice that of the districts ranked Excellent with Distinction, the percentages at higher student ratios were greater. Our ratio here in Hilliard City Schools is 19/1, with a total classroom teacher team of 687 - about the same number calculated by the Evidence Based Model. I won't try to sell what I'm saying as a high-quality analysis, but it suggests that increasing our student/teacher ratio by one or two kids won't necessarily hurt performance. This could reduce the number of teachers required by about 40, which would reduce our cost for salaries and benefits by about $3.5 million/year. I think it merits discussion. As for teacher compensation, the Strickland EBM also set guidelines. It said that statewide the compensation plus benefits cost for a teacher should average $57,812 (line 5C). Of course, it was never funded to that level, and it was never clear where the money would come from to do so. The data strongly suggests that teacher compensation is tied to the wealth of a community. Statewide, the average pay for a classroom teacher (without including benefits) is $56,850, but it ranges from $79,656 in Orange City Schools (Cuyahoga County) to $32,020 in Southern Local Schools (Meigs County). 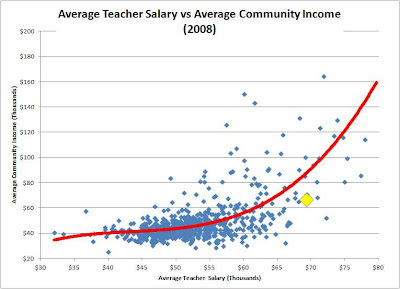 The red line is an indicator of the relationship between these two variables, and it suggests that the correlation is strong - as community income goes up, so does the compensation of the teachers. Teacher compensation is set via the adversarial collective bargaining process, with the teachers' union on one side of the table, and the school board on the other (actually, both parties are represented by professional negotiators). So what this chart really tells us is that the higher the incomes of the people of a community, the more likely they are to support the local taxation necessary to pay higher salaries to their teachers. That's not an unexpected or unreasonable outcome, but we rarely if ever talk about teacher compensation in these terms. The real challenge is relating the rate of change of local community compensation to the rate of change of teacher compensation. In the booming economy we enjoyed for a couple of decades, it came to seem normal that everyone's incomes in the private sector were going up (and house prices were marching upward, along with the balances of our 401k retirement accounts). Folks working in the private sector were getting nice raises, bonuses were pretty common, 401k matching was generous, and some even got a nice boost from employee stock option plans. During that same period, the teachers were able to introduce the 'step and lane' salary grid approach into their collective bargaining agreements which, along with decent base pay increases, rapidly accelerated their compensation to catch up with the growth of the private sector. But what happens when the economy slides in a deep recession, where unemployment climbs to very high levels, and those who are lucky enough to keep their jobs must figure how to survive with little or no raises, increasing workloads, and sometimes even salary cuts? Does the teacher compensation philosophy used during the boom years work in a prolonged recession, when both income and net worth has taken a deep hit in the private sector? In their last contracts, our teachers agreed to freeze their base pay through 2013, delay two step increases, and eliminate one altogether. The support staff union agreed to similar terms in their contract. Additionally, they have stepped up their share of the health insurance premium to 15%. Remember this contribution had been zero until 2008, and rose to 10% in the 2008-2010 contract. This was key to allowing our last levy to be 5.9 mills in spite of substantial state funding cuts, and will allow us to not ask for more funding before 2014 - barring any more surprises from the state government. We can debate how much the teachers' union was motivated by the threat of SB5 vs their empathy with the economic pain being felt in the private sector, but regardless, the result was a deal which is more appropriate to our community's current situation. Governor Kasich and the General Assembly may figure out how to allocate more state budget dollars to K-12 public education. Maybe the economy will pick up, and state tax revenues will start growing again. Maybe, but I suspect that the rate of state funding growth will be very gradual for a while. Maybe cost cutting in other government programs will free up money for public education. Maybe, but I doubt that it will be significant. The politicians talk big about cost cutting, but in practice, it's very hard to eliminate or reduce programs. If the Governor and the General Assembly do find more money for K-12 education, I wouldn't count on any of it coming our way. New dollars will first go to urban and rural districts, like Meigs County were the average compensation for teachers is less than the starting salary for ours (a good friend of mine retired a few years ago from Meigs County schools, having taught for 30+ years, and her final pay was less than a 3rd year teacher makes in our district). As I've said many times - this is a local matter. We shouldn't expect any help from the statehouse, although we shouldn't stop making our voice heard. We have to figure out how to set realistic expectations for both the teachers and the community members. That will take education, dialog and a healthy dose of respect, trust and empathy on both sides of the bargaining table.